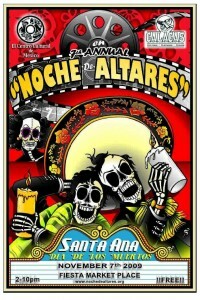 New Santa Ana | Calacas “Dia de los Muertos” exhibit opens tonight! 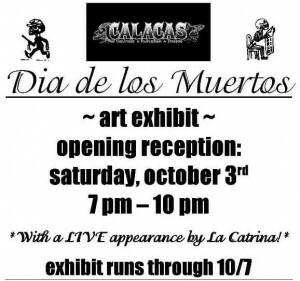 Calacas “Dia de los Muertos” exhibit opens tonight! Santa Ana’s Calacas store has announced an opening reception for a new Day of the Dead art exhibit coming up this Saturday, Oct. 3, from 7 pm to 10 pm. The festivities will include an appearance by “La Catrina.” The exhibit will run through October 7. Calacas is located at 324 W. 4th St., in downtown Santa Ana. There is free parking at the structure at 3rd and Birch. You can find out more about this event by calling Calacas at 714-662-2002 or by visiting their website. 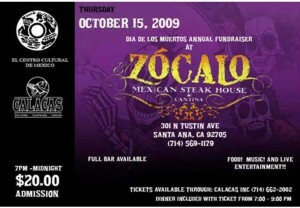 Calacas is also presenting a fundraiser for the Day of the Dead festivities, in conjunction with El Centro Cultural de Mexico, at Zocala Steak House, located at 301 N. Tustin Ave., in Santa Ana, on Friday, Oct. 15, from 7 pm to midnight. Tickets cost $20 and include food, music and entertainment. Call Calacas to buy your tickets. Click here to read about how you can enter your own Dia de los Muertos Altar in a Santa Ana art exhibit. 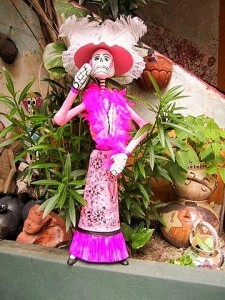 Click here to read about the upcoming Santa Ana Dia de los Muertos celebration. Click here to find out about workshops being held here in Santa Ana regarding how to make sugar skulls. Click here to read about an article that Santa Ana Mayor Miguel Pulido’s wife Laura Saari wrote about Santa Ana’s Day of the Dead festivities. « Are Santa Ana high school chemistry classes dangerously overcrowded?